Collins Booksellers - Crafts by the Sea by Larissa Costello, 9781510730588. Buy this book online. Do you love to be by the coast, walks along the beach, fishing in the sea, or hiking through the cliffs? Collecting shells, trinkets, and other items along the beach is one of the greatest ways to remember the fun you had. This coastal-themed craft book includes a variety of projects for anyone who wants to turn their collections into beautiful keepsakes. In Crafts by the Sea, Larissa Costello guides you through more than thirty crafts that are sure to delight any beach lover. Costello’s easy to follow step-by-step instructions, tips, and examples will help you produce beautiful creations that will make you feel like you are always by the sea. 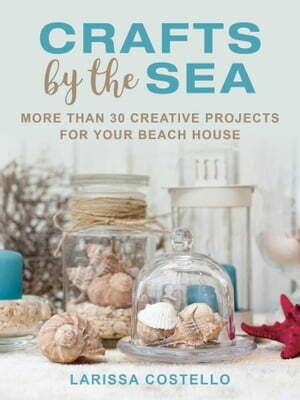 Every craft in this book incorporates the natural resources that you can find by the sea. Ranging from classic sea shell frames and wind chimes, to the popular modern comebacks of string art, and even giving rustic driftwood some extra flair, there are crafts for every style. Now that you have something to do with that shell collection, let’s get to the beach!